The Bucks are dead last in the NBA in scoring, 28th in rebounds and 22nd in assists. These are home games you should win, but the Cavs need to avoid thinking that way. They need to treat the Milwaukee Bucks like the Miami Heat, and play with passion, urgency and make every possession really matter. The Cavs have lost two straight, the Bucks four. The Bucks are dead last in the NBA in scoring, 28th in rebounds and 22nd in assists. They’re not good. But they are an NBA team and they can be dangerous. – Bucks SG O.J. Mayo sat out the previous game, a double overtime loss to the Knicks, for personal reasons. His return Friday is questionable. – Meanwhile, Bucks starting PF Ersan Ilyasova played 50 minutes vs. the Knicks, but is out tonight. Ilyasova has been bothered by a sore right ankle suffered in the preseason opener vs. the Cavs way back in October. Coach Larry Drew said Thursday the Bucks are shutting down Ilyasova "for a couple of games at least." – Drew also indicated that Antetokounmpo, who played 42 minutes vs. the Knicks as a fill-in for Mayo, will likely remain in the starting lineup. If Mayo returns, the 6-foot-10 rookie would move to small forward. – Bucks SF Caron Butler is probable. He’s missed the previous 11 games with a sore right knee. – Along with Ilyasova, Bucks PF Zaza Pachulia (foot), SF/SG Carlos Delfino (foot) and C Larry Sanders (thumb) are out. 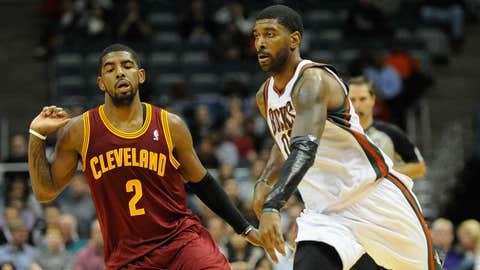 – Irving was sick and missed practice Thursday. SG Dion Waiters also sat out with tendinitis in his right wrist. Their availability is yet to be determined. – Knight is coming off a career-high 36 points vs. the Knicks. He scored 22 in the first half. – The Bucks sport an all-time road record of .500 or better against four teams — Golden State, Memphis, Sacramento and Toronto. Make it five with a win vs. the Cavs, as the Bucks are 47-48 at Cleveland. – Since Dec. 10, the Cavs are the second-highest scoring team in the NBA at 110.3 points per game. They trail only Portland (117.8) in that span. – Friday is Anderson Varejao Bobblehead Night.